Claire fiddles with a napkin, folding and unfolding it, while telling me the story of Her and Food. “I guess you could say I was raised on gluten, mostly out of boxes. Mac-and-cheese, cereal, Beef Stroganoff. And- ooh . . . pizza. At least once a week.” Claire’s story is not unusual. Being in her thirties means that her own mom was raised in the advent of the microwave and the fast food chain, when suddenly convenience took priority over healthfulness. Claire’s mom – a busy woman raising three children while working full time – definitely sought out convenience. “There were lots of ‘fend for yourself’ nights,” says Claire, “There were the nights of cereal. You know how that goes – the quantities of milk and cereal never quite match up. So you just keep eating more of it”. She grins. Claire started running- first with an inhaler for her asthma, then eventually without. Initially every other block – then for miles straight. She shed pounds. She felt great. She was eating mostly fruits, vegetables, lean meats, and gluten-free grains. “I didn’t know anything about being gluten-free back then. I’d never even heard the word ‘gluten’. It just so happened that’s what my body wanted.” Then one night, Claire fell off the deep end. She made a carrot cake for her and her roommates. She carefully trimmed around the edges of the rectangular cake, shaping it into a perfect oval. She began to eat the extra bits. She figured those would be even better with a little bit of cream cheese frosting. Sort of like the milk and cereal conundrum, one called for more of the other. She ate that way – cake, frosting, cake, frosting – until her stomach was large and sore. And then she did something she’d heard from the stall of a ballet studio bathroom, but had never personally done before. She made herself throw up. There were a few times when she did manage to get really, really, thin. This was usually when there was some kind of impending event. Like a Christmas when all her family would be back in town. Or her sister’s wedding. Or . . . her own wedding. “I was a little confused on my wedding day. That’s the day everyone’s supposed to tell you how beautiful you are. No one was telling me that. Now I look back on the pictures and I know why.” We’re sitting at Claire’s laptop and she’s able to pull up one of her wedding photos. There she is, thin as a wisp – her strapless dress is lovely but barely hanging on. Her hipbones make sharp slices of the sequined chiffon. Her chest bones are all lines and edges. Her arms are like something out of the third world, like from somewhere where you can’t get to food no matter how hard you try. She is very clearly starving. After her wedding, with the pressure off, Claire strove to eat more healthfully. She kept a food journal with the goal of eating at least 1200 calories a day. Some days she ate lots less, sometimes more. She looked for patterns. She was well aware that days of fruits, grains, and meats were better. She felt comfortable in her body and calm in her mind. Days of pastries and cereal were different. Her stomach immediately felt heavy with pain. Her face puffed. Her skin hurt. Even if she hadn’t been binging, even if she’d had just one-half muffin or a triangle of a sandwich, it certainly felt like more. After years and years of the binge-purge cycle, she could think of no other response to the physical pain than to purge. “It’s a slippery slope. At first you’re in control. You’re able to stop yourself. You can look at your food journal and know, for a fact, you have eaten healthfully. You’ve eaten just one muffin, not ten. But when your body feels like it’s binged, your eating-disordered brain says, ‘well, might as well just go for it’”. 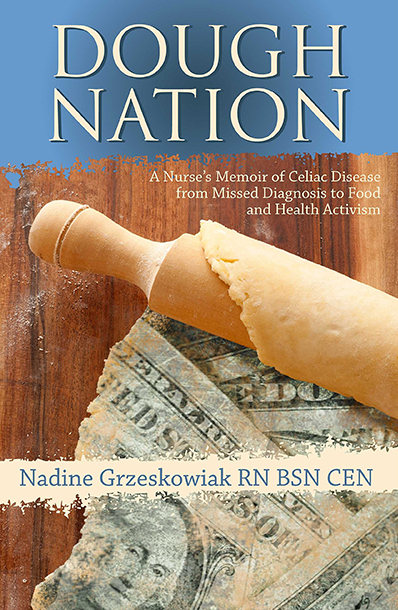 The connection between eating disorders and celiac disease or gluten intolerance is well known and well documented. Claire’s food diary is not unique. Studies with bulimic patients reveal classic celiac symptoms not only when the eating disorder is active, but even after recovery. Patients describe the same thing as Claire – leaving the table feeling quite comfortable, but then experiencing abdominal distention and discomfort to where they can only relieve themselves by purging. While food diaries show very clearly that the symptoms only occur after meals with gluten, they will be told by doctors that this is entirely psychological. Rather than being tested for celiac disease (which bulimia is a well recognized symptom of) these patients will be diagnosed as having psychological disorders. Claire fell heavily back into a phase of bulimia. She was binging and purging up to three times per day, all unbeknownst to her husband. “You get good at hiding it. There are tricks”. But then the gig was up; Claire doubled over in the bathroom at work one day, vomiting large amounts of blood. She was rushed to the doctor, who prescribed her Aciphex for a bleeding ulcer. “He knew of my long battle with bulimia. I even asked him, ‘have I done this to myself?’ He told me I hadn’t. He said it was just an ulcer… just an ulcer”. Ulcers are in fact a symptom of long-term bulimia, the result of excess acids in the stomach. In other patients, ulcers can be a common misdiagnosis for celiac disease. The two can mimic each other very closely, and doctors are often more aware of ulcers as an explanation for the burning and discomfort that follows eating. Instead of testing for celiac disease or gluten intolerance, strong medications such as Aciphex will be prescribed, and this may only exacerbate the underlying problem. In Claire’s case, the combination of medication, drug use, and poor diet likely wreaked havoc on her digestive system. Where some people are born with the propensity toward celiac disease, others may “acquire” it. Drugs (prescription or illicit) and poor diet can damage the intestinal villi, flattening it to where an inflammatory response will be had upon eating gluten. Whether Claire was born with the gene for celiac disease or she triggered the condition along the way is a mystery. But the result is the same, and painful. So there we have it. Claire’s reason for joining in on the 6 week long, gluten-free challenge. She feels like she’s been eating “mostly gluten-free already” but we take a look through her cupboards to see how true this is. Her wheat-free, Barbara’s Bakery Puffins are not gluten-free; same with the Newman’s Fig Newtons. We talk about the difference between wheat-free and gluten-free foods. It’s not just that there is a risk of cross-contamination- these products actually contain gluten. They are made with barley, or oats. Same goes for the Teeccino she’s been drinking as an alternative to coffee. Teeccino, tasty and low-acid though it may be, is made with barley. As for cross-contamination – there is plenty of risk for that in Claire’s cupboards. There are cans of perfectly good food that has been “processed on machinery shared with wheat and gluten”. We plop cans of garbanzo beans, black beans, and vegetable soup in a box, then label it “food bank”. Next we make a shopping list of good alternatives. There are plenty of cereals that are clearly labeled “gluten-free”. Same goes for cookies and crackers. As for the Teeccino, Claire has been drinking it out of concern for her sensitive stomach. We place better alternatives on her grocery list: New Orleans style coffee (low acid and with a nutty taste leant from Chicory) or black licorice tea (soothing on the stomach, plus rich enough to please most coffee drinkers). Greeks used black licorice as a thirst quencher and also to get relief from swelling that is caused by water retention. The anti inflammatory properties of licorice act on the tissues, similar to cortisone, but without the side effects. Licorice is prescribed by herbalists, naturopaths, and dieticians for treating and avoiding stomach ulcers. When consumed before meals on a regular basis, licorice can heal existing ulcers at a 91% success rate. The herb also acts as a protective stomach lining and maintains stomach acid levels. For anyone who is newly gluten-free and still struggling with stomach pain and/or inflammation, licorice can provide great relief. The remainder of Claire’s shopping list will remain unchanged, she’ll just know to read the back label more carefully from here on out. We end Claire’s challenge at Market of Choice in Corvallis, where gluten-free items are clearly marked on the shelves and we can shop easily. With a handful of snacks and two cups of tea, we settle ourselves into a corner table. “Well,” says Claire with a smile, “six weeks done”. She says this is the beginning of something great for her: a chance to restore her health. “My body feels SO much better. The exhaustion is gone. Food no longer feels like poison. After cutting out dairy, my swelling and intestinal pain has all but disappeared ”. Perhaps greatest of all, Claire says she has not binged on food for the last two and a half weeks. “That is huge for me – HUGE! Maybe two and a half weeks won’t sound like a lot to everyone else, but for me . . . it is. We’re talking about an eleven year battle with food here. To go that long eating regular portions feels like . . . freedom”.